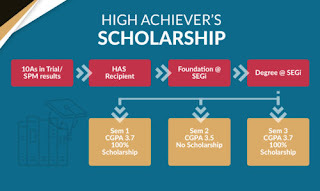 SEGi University and Colleges offers many different scholarships for eligible Malaysian students. They believe that the opportunity to maximise one’s potential through the fulfilment of studies should be available to students of all backgrounds. SEGi High Achiever’s Scholarship aims to reward academic excellence and nuture promising young people to realise their best potential. This scholarship provides students with opportunities and benefits that will help them get a head start on their choice of career. Applicant is required to meet a minimum CGPA of 3.70 every semester to continue the scholarship. Any programme that is offered at SEGi University, except for Health Science Programmes.